The San Jacinto Wilderness and nearby State Park have been on my bucket list for a long time, but the long drive to the mountain has always been just enough to keep me away. Why drive two hours to San Jacinto when the Southern Sierra is only three hours away? The Sierra always wins with me. Plus, San Jacinto State Park does not allow dogs, which reinforced my desire to focus on other areas. However, the mountains in Southern California do have some advantages over those in the Sierra Nevada. Primarily, the hiking season is much longer and more forgiving down here. While avalanches threaten the lives of climbers near Mount Whitney, our highest trails are still accessible with minimal gear until more serious winter storms barrage the mountains. This past weekend, the stars finally aligned, and we were able to explore the area under ideal conditions. Our trail of choice was the Devils Slide Trail, which starts at the Humber Park trailhead in Idyllwild-Pine Cove. 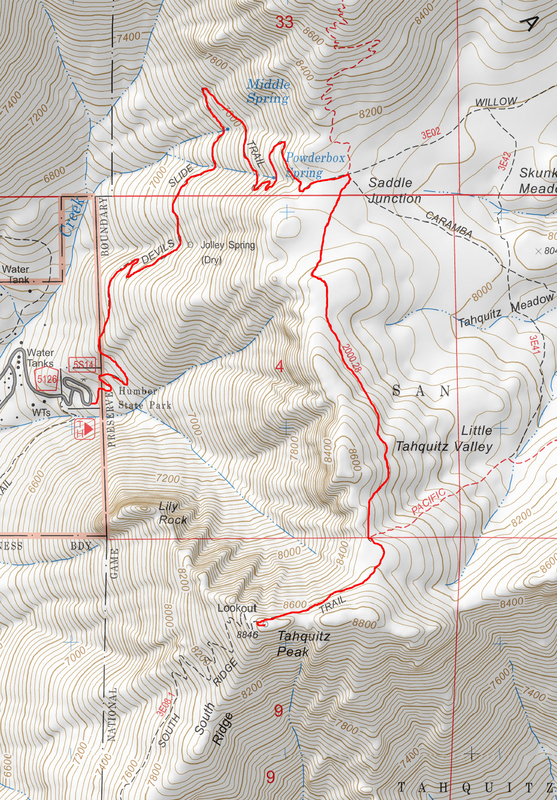 This is a very popular trail, especially in summer months, and it unfortunately requires a permit to dayhike. Make sure you grab a permit at the ranger station on your way in if you don’t want to worry about being harassed. On a positive note, this trail stays within the San Jacinto Wilderness and avoids the State Park, so it is one of the few trails in the area that caters to our canine friends. Any way you slice it, Idyllwild is a long drive from Los Angeles, and the final stretch of road is a long series of nausea inducing mountain curves as it ascends 5,000 feet up the mountain. If you are like me and have a dog as your copilot, make sure you take it easy on the drive. I made the mistake of hurrying up the mountain, and by the time I realized my mistake, Callie was lifelessly laying on the seat with a foamy puddle next to her mouth. Upon arriving at the trailhead, she sulked next to the car with her wet mane while I got our gear ready and for the first time in her life she seemed generally disinterested in the whole experience. I felt terrible for my mistake, but knew that Callie would forget all about it once we were on the trail. It took about a mile, but I was right. Soon enough she was frolicking around like nothing ever happened. The first stretch of the Devils Slide trail offers the best views of Tahquitz Peak that you’ll get. The imposing granite monolith seems more like something you’d see in Yosemite Valley than in Southern California, and it gives this trail some unique flair in comparison to every other Southern California trail that I’ve seen. The majority of elevation gain for this route occurs during the stretch from Humber Park to Saddle Junction. Over the course of 2.5 miles, the trail ascends about 1500 feet, which is flat enough to never feel unforgiving. This trail is pretty relaxing. As the trail meanders through the forest, the occasional views open up. On the opposite ridge, Suicide Rock is another out of place granite outcropping that momentarily fooled my brain into thinking we were in the Sierra. As the trail approaches Saddle Junction, a view of the surrounding area begins to open up while Suicide Rock continues to anchor the foreground. Around this point is when we started regularly seeing snow on the trail. Callie was stoked to get a taste of what the winter will bring. Upon arriving at the saddle, we were greeted with a trail closure sign. 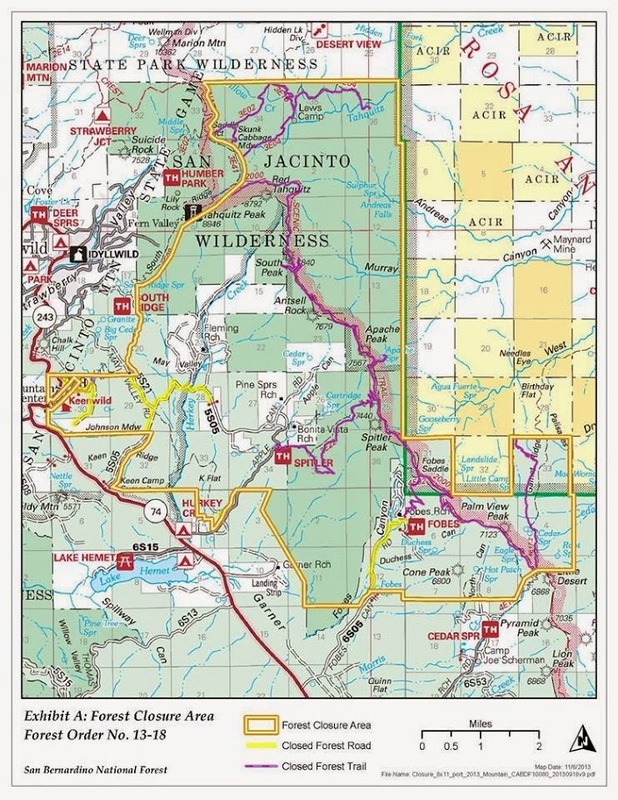 A section of the wilderness here was recently closed for at least a year to allow it to recover from a wildfire that occurred during the previous summer (see the map below). Fortunately, this does not prevent access to Tahquitz Peak. The trail moves 1.8 miles between Saddle Junction and Tahquitz Peak, and the majority of that stretch is a surprisingly flat stroll in the woods. We began to run into snow with much more frequency, but it was never more than a few inches deep. This section of the mountains can get a few feet of snow in the middle of winter, which necessitates snowshoes to move around and makes things decidedly less dog friendly. We timed things perfectly by getting the aesthetic benefits of snow without any of the associated dangers or inconveniences. About halfway between the junction and the peak, we crossed a small seasonal creek. This was the only water source we ran into on the trail, and Callie appreciated supplementing her constant consumption of snow with some regular ole’ water. As the trail nears the summit, it traverses the northern face of Tahquitz Peak, which provides some incredible views of the area. Since the slope is northern facing, it also held more snow than the surrounding area making the view all the more special. There is a decent amount of exposure on this stretch, which means that traversing it in icy conditions is not recommended. The snow was soft and patchy on our visit which negated any major concerns and kept my microspikes packed in the bag. 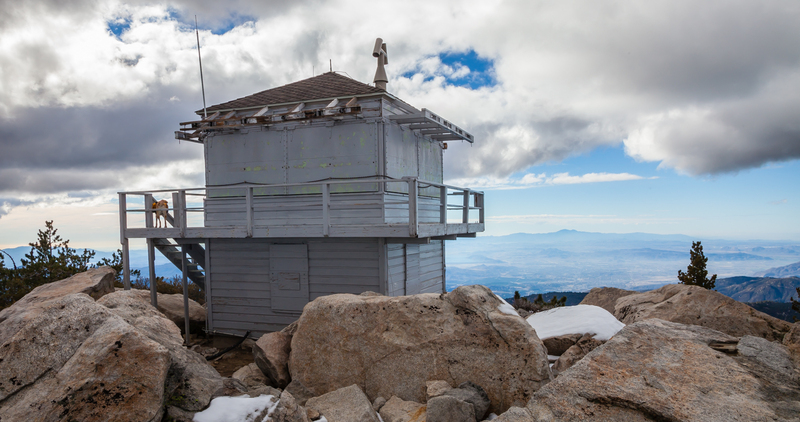 The summit of the mountain houses the Tahquitz Fire Lookout, which was in operation through 1993 and is now run by volunteers. From the lookout, the view seems to stretch forever. This is a great summit to put your feet up, relax, and take it in for awhile. I was planning on doing just that, but then we were blessed with some trail serendipity. A couple minutes after we arrived at the summit, a couple of glider planes were appeared near the lookout, and for the next 20 minutes they rode the thermals off the mountain to give us our own personal wilderness air show. Click here for a video of the action. After an unexpected treat like that on the summit, there wasn’t much left to look forward to. We retraced our steps back to the car at Humber Park while savoring some of the best views in SoCal. Now that I’ve scratched the San Jacinto Wilderness off my bucket list, I’m already plotting our next visit. Yes, I saw the leash. That looks like a great hike. I have always thought that the San Jacinto area is easily the most scenic in Southern California. I did this hike over the summer. I did a bit of exploring on the top! Very scenic…it looked much less crowded when you hiked! As always, I really enjoyed your pictures. Enjoyed your post, as I was looking for images of gliders in that area. The aircraft you encountered were not dropped off near Tahquitz, but actually launched out of Warner Springs, near Palomar Mountain in San Diego County. It is a very active gliderport for cross-country soaring. Gliders flying out of Warner Springs frequently fly a course to the Mexican border and then up to San Gorgonio (or onward to Barstow), returning to Warner Springs. These are high-performance “sailplanes” designed for fast flights of hundreds of miles, often engaged in officially sanctioned or unofficial racing events. Taquitz is a very good place to gain altitude in strong lift, before proceding. If you’re interested, check out ssa.org. The Warner Springs Gliderport sight is at skysailing.com. Thanks for the report. Last time I was there was around 30 years ago and plan on doing it end of May with my son and include San Jacinto peak. so are dogs allowed on this trail? I don’t think that is much of an option, but I haven’t researched it.